Pen Rests are now available! I’ve been wanting to offer pen rests ever since I started making pens. I’ve experimented with lots of ideas and, after much trial and error, have come up with a design and a manufacturing process that works for me. Basically, a pen rest doesn’t have to do much except hold a pen or cap to keep it from rolling away, right? I wanted a design that was functional, unobtrusive, and that would look good with any pen style. I think this one fits the mark. I also wanted to offer pen rests for anyone, not just those who order clipless pens. (They’ll get a matching pen rest automatically.) Enter the Standard Model pen rest in one, two, and three slot styles. I chose two basic, go-with-anything materials for this standard model: Alabaster Swirl and the ever-popular Solid Black. But what if someone has a favorite pen and wants a special pen rest to go with it? Enter the Custom Model! I make custom pens, so why not custom pen rests, too? I’m delighted to be able to add this writing accessory to my product line-up, and look forward to making lots of them! Check out the new Pen Rest page for details. I think they’ll make excellent stocking stuffers, too! 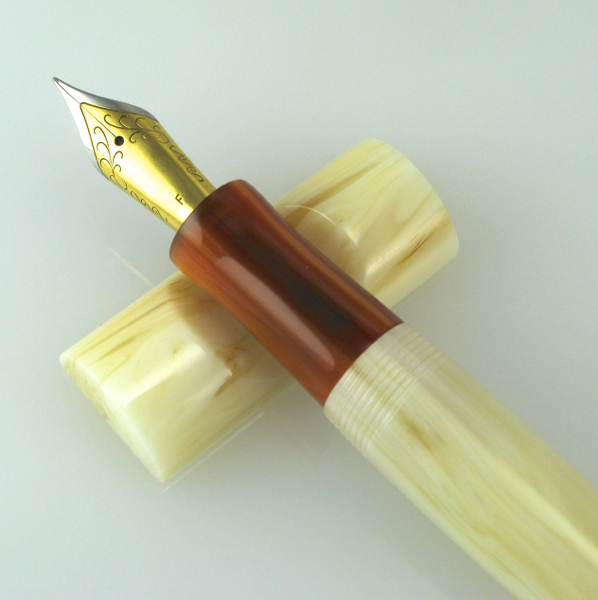 This entry was posted in News, Pen Rest by Scriptorium Pens. Bookmark the permalink.